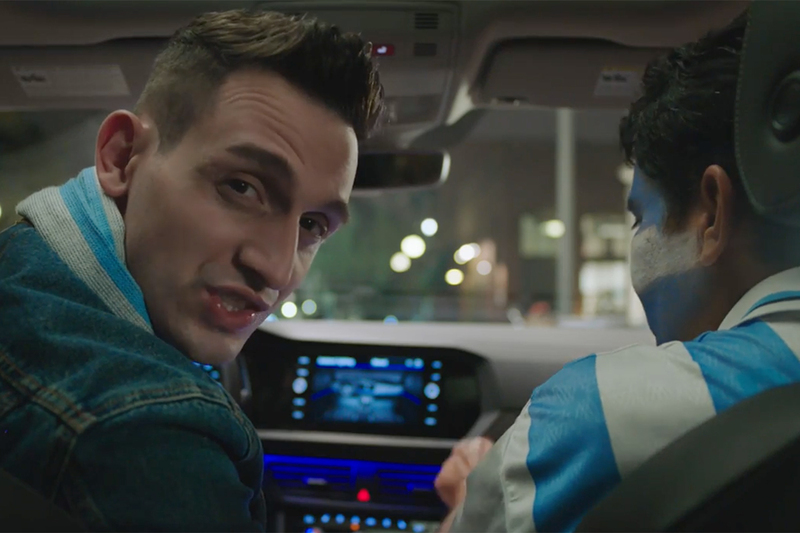 In its first significant marketing response to the emissions scandal, Volkswagen of America on Sunday began running ads in major U.S. newspapers declaring that "we're working to make things right," while plugging a customer goodwill program. 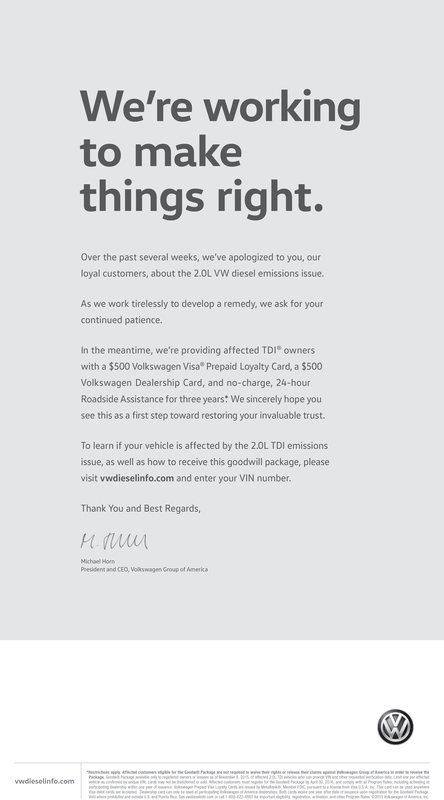 In the ad, VW Group of America CEO Michael Horn states that "over the past several weeks, we've apologized to you, our loyal customers, about the 2.0L VW diesel emissions issue. As we work tirelessly to develop a remedy, we ask for your continued patience." 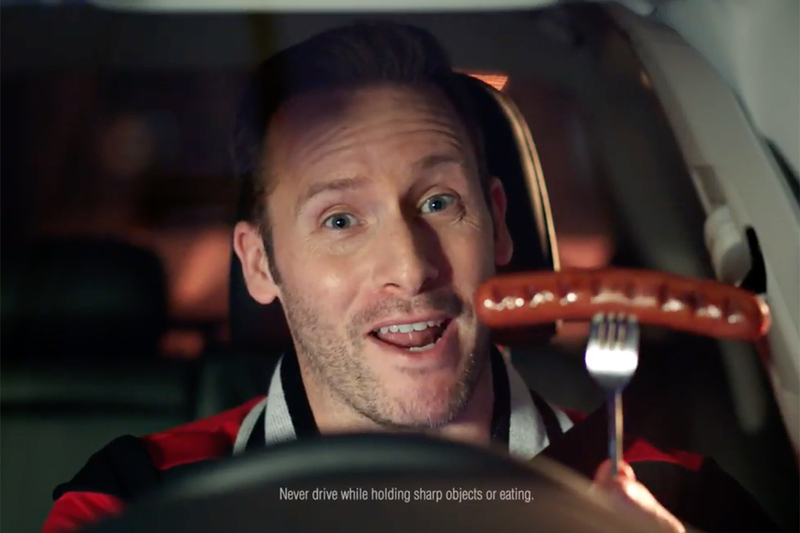 The ads are by VW's U.S. agency of record Deutsch, L.A. and mark the shop's first noticeable involvement in the automaker's effort to reclaim trust in wake of the scandal. The ads will run in more than 30 newspapers, including USA Today, New York Times, Washington Post, Chicago Tribune and Los Angeles Times. Digital banner ads are also planned. 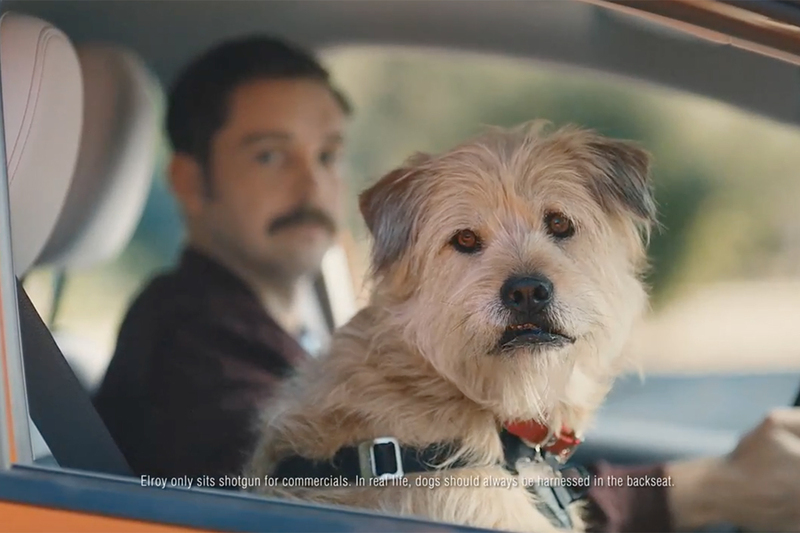 The ads plug the customer "goodwill package" the automaker rolled out Nov. 9. The program is aimed at owners of vehicles affected by the scandal and offers a $500 prepaid Visa card that can be used for any purchases, and a separate $500 "dealership card" that can be used for purchases at VW dealerships. VW has been reeling since the Environmental Protection Agency on Sept. 18 said the automaker installed so-called defeat devices on an estimated 482,000 vehicles in an alleged attempt to evade emissions testing. The goodwill package is available to owners of new and used 2.0L TDI vehicles included in the EPA notice. "We sincerely hope you see this as a first step toward restoring your invaluable trust," Mr. Horn states in the ad, which directs readers to the website, vwdieselinfo.com, where they can learn if they qualify for the package. Globally, some 11 million diesel cars are affected by the issue. 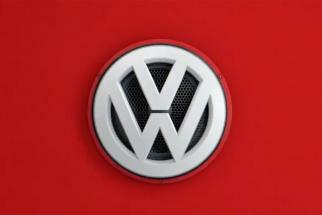 On Friday the automaker reported deliveries of 490,000 VW vehicles in October, down 5.3% from the same month a year ago.